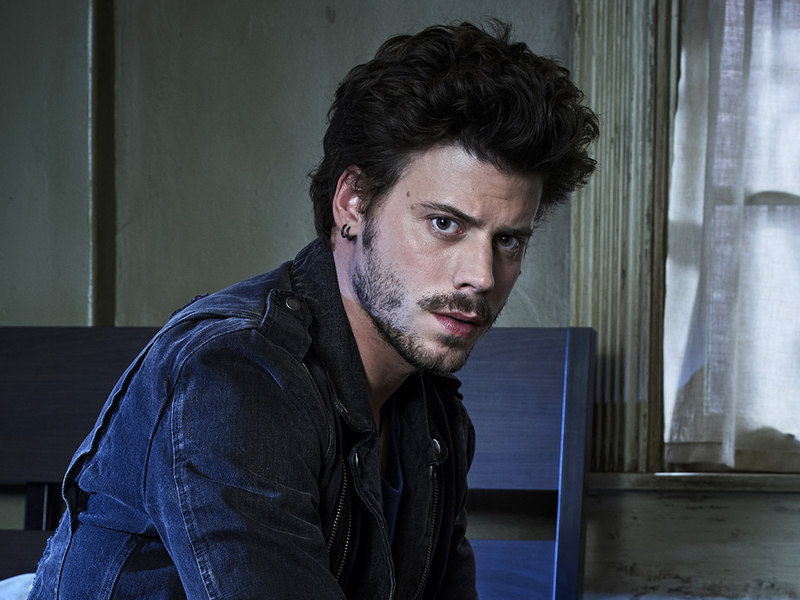 All hell’s about to break loose in Midnight, Texas, but series star Francois Arnaud swears it’s not his character’s fault. During the supernatural thriller’s recent premiere, Arnaud’s character, Manfred Bernardo, tried to commune with a murdered Midnighter when something went terribly wrong. The floorboards beneath his feet began to expand and a fiery light blazed up from the basement. Did Manfred break the veil separating the worlds of the living and the dead? Has he created Midnight’s own hellmouth? Manfred’s dead grandmother, Xylda, who lives in the ratty RV he drove to Midnight, knows the answer, but she hasn’t told him. Throughout the season, Manfred will learn more about his supernatural neighbors that include a witch, a vampire, an angel and a reverend affected by the full moon. He’ll also learn about the evil in his basement and his role in the coming war against it. Arnaud, who starred in “The Borgias” and appeared in “Blindspot,” talked with reporters about Manfred’s powers, what Arnaud brings to the role, and how happy he was that his hair was not a problem for the production. “Midnight, Texas,” adapted from the books by Charlaine Harris, airs at 10/9c Mondays on NBC. Seeing the evolution of your character across the season, what has surprised you? The plot lines have been very surprising from the start, weekly. But I think what’s surprising actually is the level of comfort that I’ve found in portraying the character. I feel like it clicks from the start; Niels [Arden Oploev], who directed the pilot, and I wanted to employ the cynical aspects of Manfred’s personality, the dark humor. I feel like, as time went on, the writers really found the character. We just saw eye to eye, and I would see in the writing how maybe previous scene performances influenced their writing style. That’s just a lovely thing to happen on a show like this. Need to go! But he was very gracious about it, and he said, “Listen, if you find something else we’re going to work around it.” The next day I got this. And two days later I auditioned for it. The four other main cast members already were cast; they just didn’t have their lead, and they’d been announced in the press and all, and they flew me to L.A. to meet with the director and do a screen test. So it took about three days to get cast in this and then the “Blindspot” people had to deal with me being in New Mexico for a month, so that wasn’t easy, but they’d promised. So they had to put it off, killing you? They still killed me off. It was a pretty brutal death. I got impaled. And how was the audition? Obviously it being a main character and a lot of the show being based on Manfred’s personality, I think it was very crucial that they find the right actor. I did a lot of scenes for the audition; we explored a lot of different avenues where it would be more or less comedic. Ultimately, I’m allowed to have more of me in this character as opposed to my character in “Blindspot” or my character in “The Borgias” or in the films that I’ve made. I’ve often played characters that were very much in control and professionals and very skilled, and I think Manfred is very sensitive and emotional and not necessarily in control of his emotions. He can be goofy. It allows me to be a bit of a doofus. So I think that’s just a testament to how they trust me with the character and how it just felt right. No. [Laughs.] I’ve done a lot of smiley roles recently, actually. I have a very smiley role coming out, a film that I did, a lovely film I did with Rebecca Hall and Dan Stevens in New York this year. Jason Sudeikis is also in it. It’s called “Permission.” It’s going to come out soon, and I’m very smiley in that. I’m just really sunny and glowy and innocent and naïve and stupid. Cesare didn’t smile much, no. He had to rule over Europe and kill people. I do kill people in this, too. Do I kill people? No, just ghost people. How does a ghost taste? It seems like you get to swallow a lot when they possess you. [Laughs.] I like how far they went with it, and in subsequent episodes it’s even more brutal. It has a [violent] vibe to it, that takes a toll on Manfred’s body. For days and weeks we explore his addiction to painkillers. It’s something that costs him, and it’s not just a trick. It’s definitely a fun show, but I really see it as a responsibility, especially as the lead character of this ensemble, to ground his experiences and to tap into real fear and real self-doubt. I just think it gives the appropriate weight to the experience. That’s kind of why he’s running, because he doesn’t want that kind of thing happening? Exactly … I don’t know what your take is on why he decides to stay, as opposed to run away, but he does run away a couple of times actually in the series. But then I think ultimately he realizes that the sense of community that he finds in Midnight is a positive thing in his life, and that he’s been fending for himself for a little too long, and that it brings him something. Obviously there’s the love story with the brilliant Sarah Ramos [starring as Creek], who is really incredibly smart. I think she brings a really great spark to that character that could just seriously be strawberry-shortcake sweet. She has a real wit. What other characters would you say impact Manfred in the first season? With Manfred sort of being at the center of all this, it has to be a little bit of everyone. When the pilot was picked up, we didn’t really know where they would take it. It was presented to us as a murder mystery. Aubrey’s disappearance was like a supernatural murder mystery, which NBC didn’t end up wanting. And then I got a little scared that it was just going to end up like a monster of the week thing, and there is an element of that, but it’s always very character-driven and so every episode focuses on one of the main character’s secrets, or past. The second episode [airing July 31] is the Rev’s storyline. It’s a full moon, something happens. It also gives every episode a different tone, so there is this episodic thing, that I think most networks are fans of, where it creates a standalone story but there’s also two main longer arcs. Aubrey’s mystery, I think, gets solved about halfway through a season. And then there’s the rumbling inside the house—that evil presence. The veil between the worlds of the living and the dead keeps fraying and sort of creates a hell mouth under Midnight, Texas. Episode 3 is Lem’s backstory so we go back to the 1800s. Long scenes in the episode make it like a period show. It just gives a different vibe, tone, to every episode, which I think keeps it fresh. But still it involves you in the character developments. There were hints that Lem and your grandmother knew each other. Are we going to learn more about that? It’s the early 1900s, not the 1800s. I think it’s both actually. Yes, we see two younger incarnations of Xylda throughout the season. One is very young, and one is when Manfred was a child, so in Episode 9 there are scenes that sadly I didn’t get to play because I can’t play a five-year-old version of myself. Of course I tried. But there are really moving scenes where you see a young Manfred trying to cope with the first beginnings of his power and the effect it has on other people. Do you know if your powers are inherited from your parents? Manfred comes from a long line of self-identified gypsies … I think traditionally, in fiction, I guess psychic powers are passed on through blood but they often skip a generation. So he definitely got it from his grandmother, but to a different extent. I think her powers were very limited, actually, and his powers go beyond anything that he imagined. And he didn’t necessarily have access to them before but, faced with saving the world, as one is, he has no choice. Does he know all of his powers when we first meet him? No he doesn’t. He knows that he’s a psychic. Part of the backstory of Xylda and Manfred is that it didn’t always work. They would do readings for people and if it didn’t happen they just pretended. They ran a lot of scams. They pissed off a lot of people and those people are after Manfred for a lot of money. He owes a lot of money to a lot of different people—living and dead. That’s what sort of drives him to Midnight. That’s what happens in Midnight because, as the veil is fraying, the first effect that that has is that it sort of enhances everyone’s inner demons. And so Lem as a vampire has a harder time controlling his urges for blood, for example. That’s what’s also interesting: The threats to Midnight and the main characters are often themselves as opposed to just having a monster coming in from the outside. Because the veil is fraying, a full moon is all the more powerful. It’s so weird! Was there any point, in terms of conversations, where you were surprised with a direction the show was going? I was always on board with keeping some of the humor in the dialogue and the characters. But I’m very happy with the way we steered away, after the pilot, from the more whimsical aspects of the show. … Visually it’s much darker. The director of photography, Mike Spragg, has mostly done very gritty cable television in England, and is able to create really amazing atmospheres very efficiently. But it’s much darker. It has less of a Harry Potter, sort of family vibe to it. The humor’s still there, but I think it’s scarier … It’s not really gory, but it’s definitely more atmospheric and isn’t afraid of tension. I’m pleasantly surprised with that.